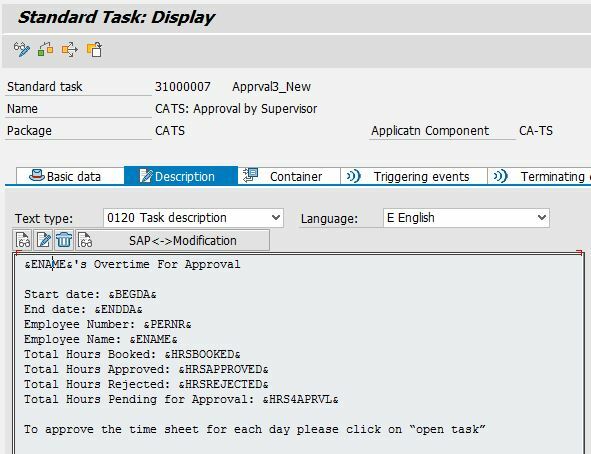 CATS – Cross application time sheet workflow is a single step task and it doesn’t have any WSXXXXXXXX template associated. This blog explains all functional and technical aspects of how workflow task for CATS should be configured to work for my inbox. You should create your own profile with the help of the functional resource. Without approval procedure: Data recorded with this data entry profile are not subject to an approval procedure. The data is to be made available for transfer to the target applications directly after saving or release. With approval procedure: All working times recorded with this data entry profile are subject to an approval procedure. With approval procedure for exceptions: Only working times recorded with this data entry profile that are subject to the provisions specified additionally in the Rule Group for Special Approval are subject to an approval procedure. To configure this workflow using my inbox you need to maintain following parameters in the Gateway config. Above configuration will enable you to get the approve and reject button in my inbox. Select above task and click on “Visualization Parameter” on left. 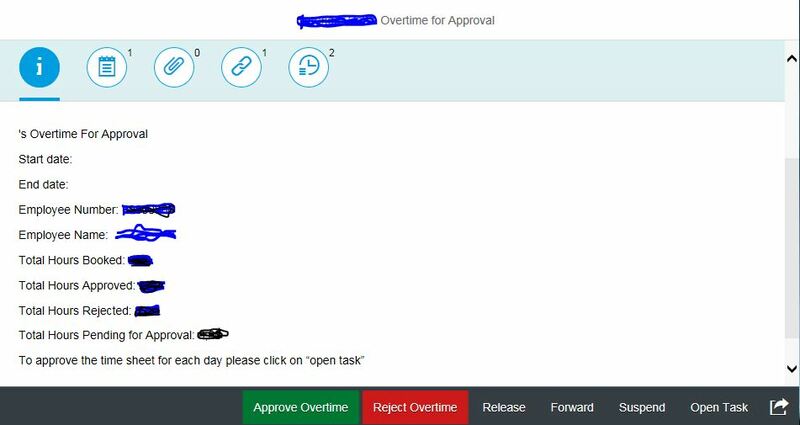 After above configuration if you are using standard task then below screen will popup on click of “Open task” button. you need to implement badi mentioned below to decide action on approval/ rejection using Green/ Red buttons. For determining approval and rejection based action you put the source code in below badi. Do not forget to maintain the filter value for this. Please refer to your gateway workflow configuration for this step. Any wrong config for this will not allow your badi to execute. In the method /IWWRK/IF_WF_WI_BEFORE_UPD_IB~BEFORE_UPDATE you will update the logic that you want to update. in this case it will be the CATSDB table update. User your development team to write code in above badi as this is very customer specific. 1. A lot of blogs refer to creating custom workflow for CATS. 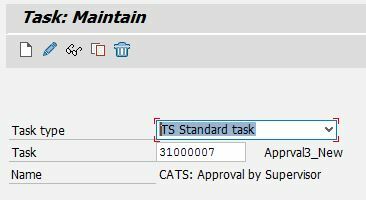 It is not recommended to create custom workflow because catsdb table in this case stores the workitem number. This workitem id is the id of task configured in profile which is TS31000007. If you create the custom workflow then your application will never work when you click the open task.